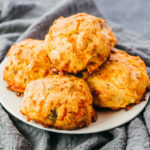 These almond flour biscuits with bacon and cheddar cheese are easy-to-make savory treats for anyone on a keto or low carb diet. Enjoy them for breakfast, lunch, or as a snack. Cook bacon slices on a pan over medium heat until crispy, 5 to 10 minutes, turning them over occasionally. Drain bacon on a paper towel. When cool, crumble into small pieces. Position an oven rack in the lower half of the oven, and preheat to 375 F.
In a large mixing bowl, add almond flour and salt, stirring until well-mixed. Add all remaining ingredients except the bacon to the mixing bowl. Stir for a minute until the dough is well-mixed, with the almond flour being completely incorporated. Add crumbled bacon to the mixing bowl, stirring it in. Evenly divide the dough into 8 mounds on a baking sheet lined with parchment paper (or similar nonstick surface like a baking mat to help the biscuits slide right off after baking), spaced about 1-2 inches apart. Bake at 375 F until the biscuits are browned and crispy on the outside, 25 to 30 minutes. Since ovens vary, start checking if they're done at the 20 minute mark. Let them cool for 10 minutes before serving. For leftovers, store the biscuits in a covered container in the refrigerator for up to a few days. To reheat, place the biscuits on a nonstick pan over medium-low heat until warmed through, turning them occasionally to avoid over-browning. No oil necessary. Avoid the microwave for reheating because it makes the biscuits soggy.